Are you looking for new house siding in Fredericksburg, Virginia, or any nearby community? If so, the professionals at MR. FIX-IT™ can help. Our team is proud to offer area residents an impressive variety of siding styles and material options, allowing you to choose the best products for your home. Whether you want the classic appeal of Dutch lap or instead prefer rustic shake cladding, our team can provide you with the house siding options you’re looking for. 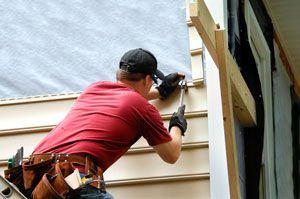 No matter which of these siding options you select, you’ll be able to rely on the expert services of our installation team, whose top-notch work has helped us earn and keep an A+ rating from the Better Business Bureau. To learn more about the house siding options that we offer and install in Fredericksburg, VA, and all neighboring communities, contact MR. FIX-IT™ today.